"This spicy sauce is made with everything Italian--capers, olives, garlic, tomatoes, anchovies, and hot peppers. 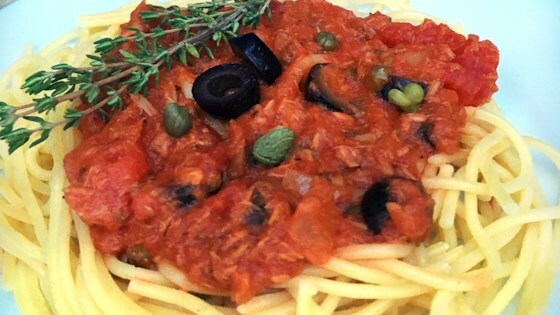 Paired with canned tuna and served with spaghetti, this dish will surely lure your entire family to the dinner table." Bring a large pot of lightly salted water to a boil. Cook spaghetti in the boiling water, stirring occasionally until tender yet firm to the bite, about 12 minutes. Drain, reserving about 1/2 cup cooking water. Heat olive oil in medium-sized pot over medium-high heat. Cook and stir onion until it starts turning translucent, 3 to 5 minutes. Add tuna, garlic, cayenne pepper, capers, and olive slices. Cook 3 to 4 minutes longer. Stir in tomatoes, herbes de Provence, and anchovy paste. Simmer for 10 minutes. Add Barilla(R) Traditional pasta sauce. Bring to a boil; reduce heat to medium-low and simmer 20 minutes. If sauce seems too thick, add a few tablespoons of reserved pasta cooking water. Serve over pasta. The flavors marry perfectly. This is a fast and easy version of this timeless classic.